Dividend paying Mutual Funds are generally considered when you have periodic cash flow requirement. It would be good investment choice post-retirement. In addition to that if you are risk averse investor dividend paying mutual fund could be very good choice compare to fixed deposit and other investment instruments. Dividend paying mutual funds and stocks also give you a cushion against stock market volatility. These type of mutual funds can help you during uncertain income condition. However, it is difficult to identify good dividend paying mutual fund for investment. You need to carry out research and analysis to find out good fund for investment. If you don’t have time and energy to carry out analysis here is a ready made list of Top Dividend Paying Mutual Funds In India. How dividend paying mutual funds works? 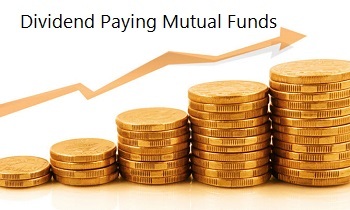 The main objective of the Dividend Paying mutual fund is to pay dividend payout to the investor regularly. Let’s take a look at how these funds work. The fund manager of the scheme invests the money in the equities. When scheme makes profits by selling equities or by receiving dividend it may be offered to fund holders via dividend payout. If a scheme is not making any profit dividend may not be paid. The case may be that part of the profit will be held by the scheme and added into NAV (Net asset value). Net Asset Value (NAV) may be reduced on a declaration of dividend. As such declaration of dividend is not fixed. It may be quarterly, half yearly or annually as the case may be. The dividend amount is directly credited to fund holder’s bank account directly. If investors have selected an option to reinvest dividend it will be reinvested at existing NAV and unit will be credited to fund holder’s account. No tax is applicable on dividend earned from mutual fund scheme. These type of scheme does not offer any guarantee of dividend payout. If a scheme is making losses dividend shall not be paid. Who should Invest in Dividend Paying mutual funds? Dividend paying mutual funds are not a cup of tea for every investor. The following types of investor can plan to invest in dividend paying mutual funds. Franklin India Bluechip Fund (D) – The first fund on the list is Franklin India Bluechip Fund. The primary objective of this fund is to provide long term capital appreciation. Major investment of this fund is in bluechip stocks. This fund has given a decent return to the investor in the past. Dividend payment history of this fund is very good. Aditya Birla Sun Life Top 100 Fund (D) – Aditya Birla Sun Life Top 100 fund is the second fund on the list. This fund has given very good return to the investor in the past. It is a diversified fund with a major holding in the banking sector. A dividend history of this fund is very good. DSP BlackRock Equity Fund – Regular Plan (D) – DSP BlackRock Equity fund is another very good dividend paying mutual fund. This year DSP BlackRock equity fund has generated 16.8% return to the investor. Franklin India Prima Fund (D) – Franklin India Prima Fund is small cap and mid cap category fund. Historically this fund has generated a very good return for the investor. The latest Dividend yield of this fund was 8.83%. Reliance Vision (D) – Reliance Vision Dividend fund is another very good fund for the dividend payout. It is large cap category fund. This fund has generated 20.6% return for the investor in last one year. It is consistent dividend paying fund. Note – Above funds are selected based on dividend payout history and fund performance of past five years. Investor are requested to take conscious call before investing in mutual funds. Do you think investment in dividend paying mutual fund is good investment strategy? I am investing in mutual funds since 1991,when it was just begining of MFs. The Funds selected are excellent & worth investing —subject to horizon of 3-5 years for Handsome gains or for consistent dividends. I have retired from service & am lookimg for safe investment in debt funds. You can plan to invest in Axis Liquid fund or Birla Sunlife Cash Plus.